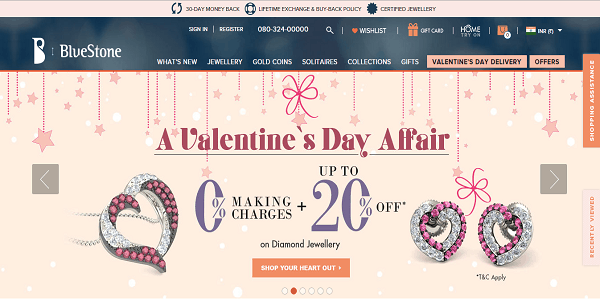 CASE STUDY: How BlueStone became the leader in untapped online jewellery space? 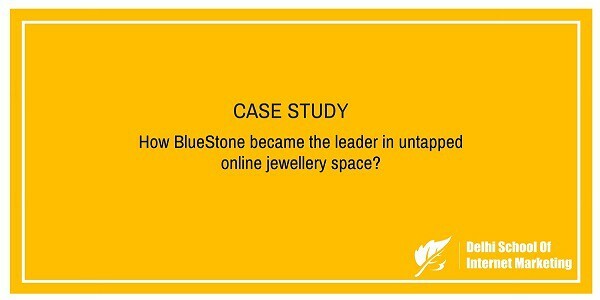 Home > Blog > Blog > CASE STUDY: How BlueStone became the leader in untapped online jewellery space? 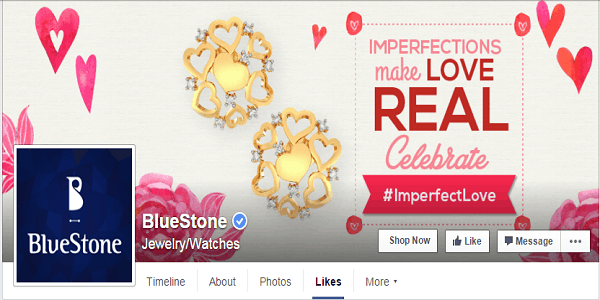 4) What made BlueStone to lead in the online jewellery space? 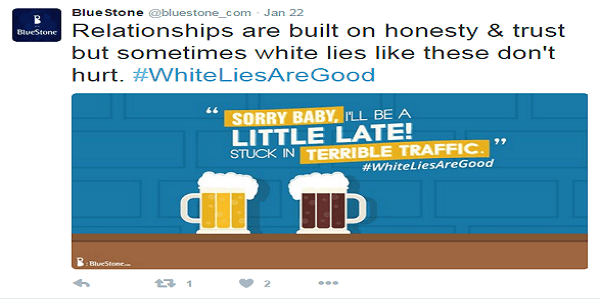 5) How BlueStone uses social media platforms? Indian Jewellery industry is one of the fastest growing segments on Indian economy. BlueStone is an online jewellery brand that offers an unmatched collection of certified jewellery to be browsed at leisure and purchased from the comfort of your homes. BlueStone is a prominent size jewellery Ecommerce B2C website. BlueStone is one of the first companies to deliver the online elite, which aims at revolutionizing the Jewelry and lifestyle Ecommerce picture in India with its firm focus on affordability, quality and user experience. BlueStone becomes one of the fastest growing online players, consistently achieving 2.5X revenues relative to previous year. BlueStone claims to have grown by 150 percent year-on-year. Started in the year 2011 with around 300 jewellery designs, BlueStone today has over 5,000 designs across 14 categories. BlueStone, a Bangalore based online jewellery startup, offers jewellery under its own brand name. BlueStone is a classic case of how internet and technology is transforming a traditional capital intensive industry like jewellery with lean operations and just-in time inventory model. In the e-commerce market, BlueStone.com founders Gaurav Singh Kushwaha and Vidya Nataraj saw an opportunity for a relatively untouched category such as jewellery. This way, high maintenance and inventory costs and other logistical challenges faced by traditional brick-and-mortar jewellery retailers could be avoided. BlueStone has so far raised close to $30 million in funding across three rounds from Accel Partners, Kalaari Capital, IvyCap ventures, Meena Ganesh, Samar Capital, Dragoneer, and Ratan Tata. 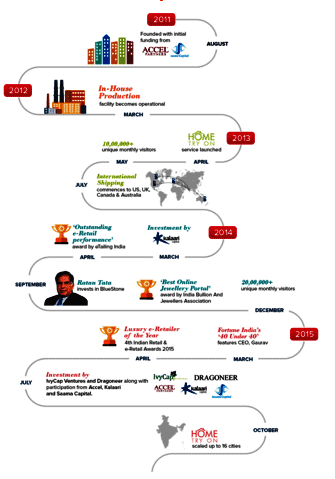 Started in April 2012, the website has annual revenue of INR 35 crore. It expects to break even and record revenue of INR 120 crore in 2014-15. [su_box title=”More Case Studies from DSIM” box_color=”#c7c7c7″ title_color=”#000000″ radius=”5″]1) How Micromax created a niche for itself and became number #2 smartphone vendor in India? 2) How Seagate bypasses B2B channels and came into B2C model using Digital Medium? BlueStone has annual revenue worth INR 100 crore. The average order size on the site is worth INR 15,000 and customers in the age group of 25-45 years from majority of the customer base. The company receives a large number of orders from small towns and 30-35 percent of its business comes from beyond top 20 cities of India and 4-5 percent from international markets. With progressive figures following the company, BlueStone has now embarked on an elaborate brand building exercise. In about five to ten years, BlueStone targets to grab about 2-3% of the $100 billion jewellery market in India. What made BlueStone to lead in the online jewellery space? BlueStone has the strongest consumer engagement and online brand recall among its peers. It has a clear leadership in traffic over peers and leads Caratlane in brand searches. BlueStone is a contemporary and exclusive jewellery destination, suitable for every mood of romance and aims to make jewellery shopping and gifting an enjoyable and intimate experience. All collections speak the brand story and resonate with real life situations and stories of the target audience. Offline SIS Stores – For ‘Touch & Feel’- To enhance the customer experience, the company opened experience/display centres in Bengaluru, Mumbai and Delhi. Home Try On – Bringing luxury at your doorstep – allows users to shortlist Jewellery pieces and requests a trial at home, at their convenience. Currently, this facility is live across 16 cities including Delhi NCR, Mumbai, Bangalore, Chennai, Hyderabad, etc. Tremendous potential for penetration and growth once the channel is aggressively promoted through marketing campaigns. A home try-on service launched a year ago is witnessing traction of 150-200 customers a month and conversions as high as 70 per cent. Innovative initiatives to enhance user buying experience – Shopping Assistant Tool where you can shop by personality, face shape, etc. BlueStone has an award-winning in-house merchandising team that comes up with diverse collections catering to all religions, regions, cultures and occasions. How BlueStone uses social media platforms? BlueStone has a 360 degree approach to engage with its customers and capture the market. Social Media marketing is one of the Biggie when it comes to ecommerce marketing trends and spends. Social Media accounts for quite a significant percentage of web store traffic and revenue. No other media can get such amazing returns. BlueStone used its various social media platforms effectively to increase its brand awareness and engagement. BlueStone uses each social media platform to reach out and stay connected with their dedicated fans and followers. The power of social media helps to create a new attraction at BlueStone on this valentine. Facebook and Twitter users help come up with ideas for the latest attraction at BlueStone.com. BlueStone engages with their followers on regular basis by responding their queries and re-tweeting what others say about BlueStone. 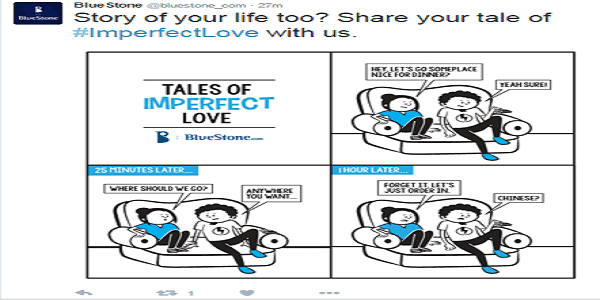 BlueStone launches new contest on occasions and share it over the Twitter platform. 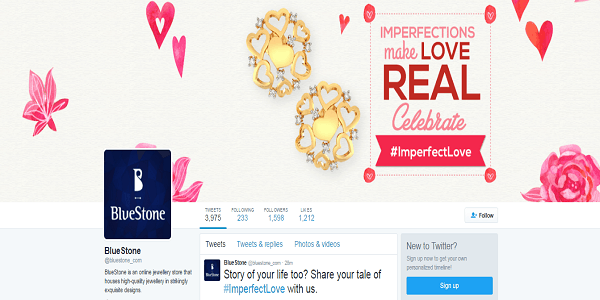 On this Valentine, BlueStone launched a contest on Twitter. Story of your life too? Share your tale of #ImperfectLove with us. Participants needed to follow and RT the tweets too, apart from sharing creative responses. BlueStone’s have developed a series of their own hashtags that tie in with their running campaigns and frequent content – for example #Makeitperious in wedding season, #GiftThoughtfully around the Christmas period and #WhatToWearWhen, which took place in December. BlueStone Facebook page was created in 2011. BlueStone has more than 642,142 fans. BlueStone uses Facebook as a platform where their fans can connect with them for open discussions to share their stories, ideas, suggestions, or comments. Through Facebook, BlueStone directly and actively connects with its fans. Fans can also build their own virtual images and share it using Facebook. TV advertising seems to be the new trend that is catching up quite well with most ecommerce businesses. Television ads are crisp, creative and engaging with the customers. BlueStone is now in the phase of changing consumer behaviour when it comes to online jewellery buying in India. With more consumers getting comfortable with the concept of buying their jewellery online, BlueStone has only grown every year. And it hopes to continue its growth journey with this new campaign. The latest BlueStone.com TV ad celebrates Real Love in this Valentine’s Day. BlueStone tells viewers to celebrate your love in the new ad film. #AaoBrowseKarein: Discover the romance in browsing with BlueStone.com. In this campaign the brand has chosen to target young, urban couples with its social media oriented promotion. These social media platforms have been effectively used by BlueStone in order to enhance their capabilities and grow rapidly. BlueStone keeps sharing valuable contents through all these social media platforms. Apart from this, BlueStone responds to their fans and followers and listens to them with the aim to serve them better and take valuable ideas and feedback. By doing all of these, BlueStone become able to show it openly that it cares for the fans and makes them feel that they are an integral part of the company. BlueStone understands their audience and the importance of social media.